Our quick overview of major diseases in America in 2013 is to give you an insight into some of the most reported conditions in the USA so far this year. Our information comes from a variety of locations including the government’s Center for Disease Control and the Infectious Diseases Society of America. This overview looks at diseases from both the standpoint of wide area outbreaks and severity of the disease. Let us look at five diseases you need to be aware of this year. 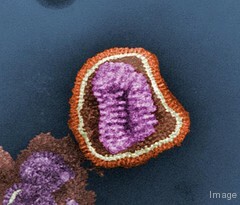 Our first position goes to influenza. This broad category of disease is responsible for the broadest level of illness in the country. Each year new strains of influenza race around the world killing children and senior citizens. This year has been no exception. We can expect as seasons change later this year a new round of influenza to infect our population. This viral infection is hard to battle, but we now have annual immunizations for some of the most virulent strains. Red eye is another of the major strains of disease that is striking hard this year. Conjunctivitis (Pink Eye) comes in two common varieties, bacterial and viral. Most outbreaks are caused by bacterial infections that are spread by simple touching. Bacterial conjunctivitis clears up after approximately 8 days but can be accelerated with treatment with antibiotics or antibacterial washes. Viral conjunctivitis usually accompanies other viral infections with cold or flu like symptoms and passes as the virus abates. This virus continues to be one of the top problems in the USA. This virus spreads by mosquito and ticks bites. The reason it is included in our overview of major diseases in America in 2013 is due to the lack of effective treatment. Most cases of West Nile Virus cause any problems, but some cases escalate into a form of encephalitis, a neuro-invasive disease. At this stage West Nile Virus becomes life threatening. The only available treatment is to provide supporting care and patience. The disease can take sixty to ninety days to complete its cycle. This disease was believed to be eradicated in the USA a few years ago, but has been making a comeback. We classify it as a major disease due to its appearance spreading to more states in 2013. The disease is known as pertussis. The disease is preventable with the use of vaccines. Once infected a patient should be treated with antibiotics to reduce the chances of severe complications. This disease is responsible for over 295,000 worldwide deaths annually. This disease if more commonly known as the bird flu due to it being a virus specific to birds that is now able to transfer to humans. Strains of Avian Influenza killed millions of birds In Asia and are responsible for limited human deaths, also. This threat has been rapidly spreading worldwide and is expected to be a major concern in the USA throughout 2013 and beyond. These five disease are some of the major diseases in America in 2013 you must pay attention to. If you become aware of outbreaks of any of these diseases in your area consult with your doctor for the proper preventive measures. Check to ensure your vaccinations are up to the date to prevent the onset of Whooping cough. Prevention is always the best course of action. Your doctor can advise you when new vaccinations become available for influenza. We advise watching local reports during mosquito season to be aware of West Nile Virus in your area. Using a good quality mosquito repellant can help reduce your risk to this virulent disease. Check also list of most deadly diseases in 2013 and list of most popular dietary supplements, vitamins and natural home remedies in 2013.